June 11, 2012 Do Book Covers Matter? In traditional publishing, the answer is an emphatic yes. Take, for instance, what happened with Harlequin’s Blaze line when they switched from this to this. As you can imagine, the hero-centric covers helped to increase the line’s sales. But what about the covers of self-published e-books?Is there a correlation between cover art and sales? The answer to that question is a much less emphatic yes. A good example is Tracey Garvis Graves’ On The Island. In my opinion, the original cover for the book just wasn’t that great. It didn’t do much for the eye and it looked low budget. Nevertheless, the book gained a huge word of mouth following and became a best seller. It was eventually picked up by Penguin, who gave it this cover. Clearly, covers matter. They just seem to matter less for those e-books that are able to build sales based on word of mouth. Covers also seem to have less of an effect on niche market sales. If you write in a genre that has been largely ignored by major publishers (ex. multicultural erotica), readers may be more willing to forgive a low budget–or sometimes even downright awful–cover. Your initial investment might be better spent hiring a professional editor rather than paying someone to design a great cover. In general, though, readers do judge e-books by their covers. An outstanding cover informs the reader that you’ve taken the time to produce a quality product. It often signals that the book has been professionally edited and is free of the pesky typos that plague so many readers of self-published books. 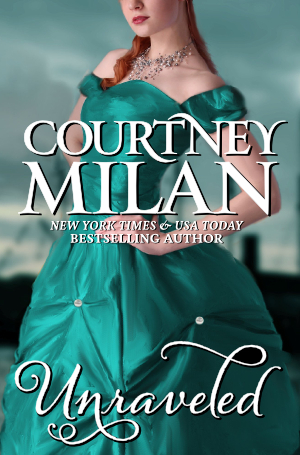 As an example, check out the cover of Courtney Milan’s Unraveled. This was the self-published third book in her Turner Trilogy, pictured below. The first two books in the series were published by HQN. There’s almost complete continuity between the covers of the two traditionally published books and the cover for the self-pubbed e-book. This signaled to readers that even though the author had decided to go the self-publishing route for the third book, she still placed the same level of importance on professional quality design, editing, and storytelling. Needless to say, the e-book was a success. So what do you think? Do you still judge an e-book by its cover?